You are at:HomeUncategorizedWhy is SHE parking there? 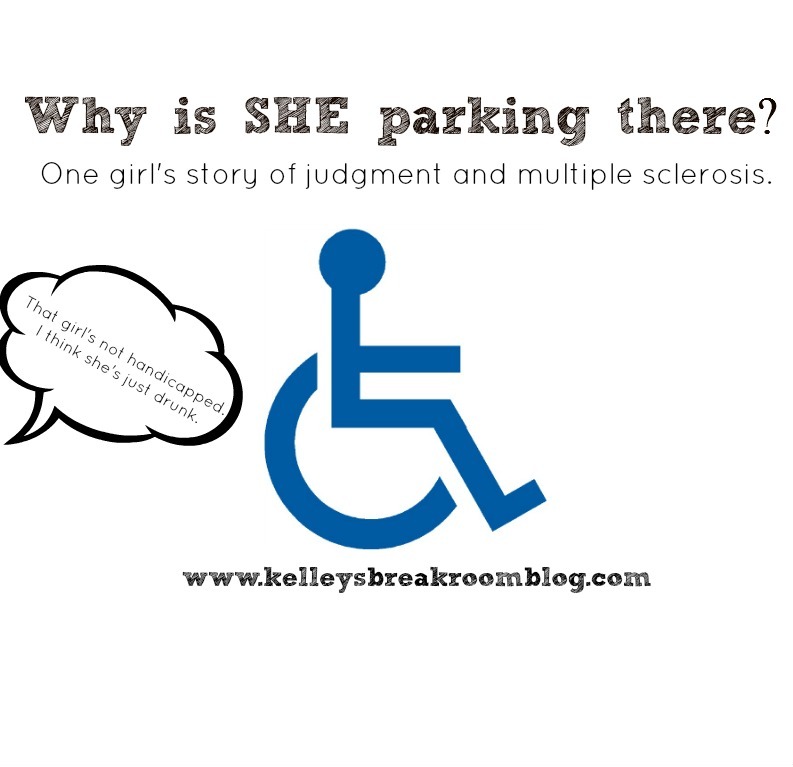 One girl’s story of judgment and multiple sclerosis. Why is SHE parking there? One girl’s story of judgment and multiple sclerosis. It’s 1993. As you head to your college class, you see that funny brown-headed girl trip going up the stairs. You giggle to yourself and are thankful you are not as clumsy as her. You saw her tripping earlier that day. You say something to her about watching her step. She just smiles and laughs and says something about not trying out for the dance team anytime soon. It’s 2009. As you make your weekly trek to Target, you see that girl from college again. She is in her mid-thirties now and you are surprised to see her get out of the car in the handicapped parking spot. She doesn’t look handicapped to you. You remember her being a little clumsy, but handicapped? Please. You are wondering where she was lucky enough to snag one of those handicapped parking placards. You ask her because you are feeling cantankerous and grumpy. She just smiles and laughs and says something about finding it on sale at the dollar store. It’s 2011. At lunch, you see the same girl again. This time she is eating with her teenage son. As you head toward the ladies room, you see that she is doing the same. She is swaying a bit, though, and you shake your head in disbelief. What type of girl gets drunk with her teenage son at lunch? Because you are still cantankerous and grumpy while the two of you are washing your hands, you ask her if she always gets drunk with minors. She just smiles and laughs and says something about it being one of her favorite hobbies. You never see the girl again. She comes to your mind on occasion when you see other seemingly able bodied people emerge from handicapped parking spots or drunks. You are sooooo glad you are not like them. That girl is my friend. From the National MS Society: Multiple sclerosis (or MS) is a chronic, often disabling disease that attacks the central nervous system (CNS), which is made up of the brain, spinal cord, and optic nerves. Symptoms may be mild, such as numbness in the limbs, or severe, such as paralysis or loss of vision. The progress, severity, and specific symptoms of MS are unpredictable and vary from one person to another. Today, new treatments and advances in research are giving new hope to people affected by the disease. She noticed problems when she was in college on a scholarship. At 18, she lost the feeling in her feet but gradually regained the ability to walk. She married that same year. For 3 years, she was symptom-free until she gave birth to her beautiful son. In October 1, 1996, the “most horrible day” in her life, she was formally diagnosed with MS while alone with a cold physician who carelessly dropped the heartbreaking news on her. Just prior to receiving the news, her husband had to step out with their infant son. Since that time, she has dealt with blurry vision, blindness, difficulty walking, excruciating pain (“Imagine your worst day of pain. That is my best day”), chemotherapy treatments, the inability to take effective pain medication, double vision, inability to be out in the hot sun for long, fatigue, not being able to jump, ride a bike, hike, and rock climb, loss of independence, loss of a dear friend with MS who took her own life and ridicule from others. Yet she still smiles and laughs. She does not take all the credit for her outlook on life. The spotlight is often diverted to her husband, her best friend and constant supporter. Because he “does not believe in people wasting their lives”, he often gives her a set amount of time to “whine and complain” about her day and then they move on. “If he allowed me to keep complaining, I would fall into a deep depression”. She also gives much credit to the support and love she receives from her son, her parents and her friends. She actually feels that MS has been a blessing in her life. Although her life took a dramatic turn at such a young age, she is not bitter about it. Instead she encourages all of us to not take life for granted. “Don’t say you will do something tomorrow because tomorrow may not come. Don’t wait until later to say you’re sorry . Don’t wait to hug. Don’t go to bed angry because you may not wake up.” She radiates beauty, love and light. It is no wonder that her teenage son loves being around his parents. He is a very responsible and giving young man who is also a very successful musician, rock climber and in the top 8% of his class. Since this blog is dedicated to humor, I thought my friend was the perfect source for understanding the importance of smiling and laughter in the midst of a hurting world full of pain, loss and regret. I see her time and time again enjoying life, encouraging others, hugging her son, laughing with her husband, making jokes and I wonder how she smiles through it all. She loves people. She wants to be around them and she feels if she were to become gloomy and succumb to how she feels inside, people would not want to be around her. She never wants pity. She says she is as happy as anyone else. Somehow, she pushes the pain out of her mind. She ignores it and she focuses on you and the things that you are dealing with in your life. And I thought you would want to meet her.